Doug Cronshaw. Photograph courtesy of Martin Fitzgerald. Originally the running mate of another famous Stock Car Racing son of Rochdale. Doug was initially the more successful of the two; being the first to win a final in 1967 and ending the 1968 season placed number five in the national points series, two above his racing partner, Stuart Smith. A lightweight, Pontiac-powered, car took Doug to the 1970 British Championship and this car, when fitted with a 454 Chevy engine for the 1971 season and now dubbed the ‘Potent Mix’, carried Doug to World Final glory at Brandon. Using his sideways shale style that became so characteristic, Doug was a prolific final winner throughout the remainder of the 1970s. 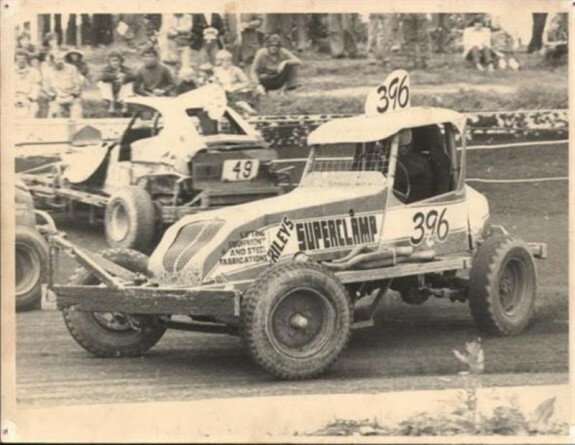 Initially calling it a day after the 1979 season, he returned for one last meeting, ostensibly to set up a car he had built for John Toulson – and promptly won the meeting final, taking his tally to an outstanding 114.